“A Quaker Study” is humming right along, due largely to the fact that many of the design elements are repeats so there’s not a lot of time spent consulting the chart every few minutes. 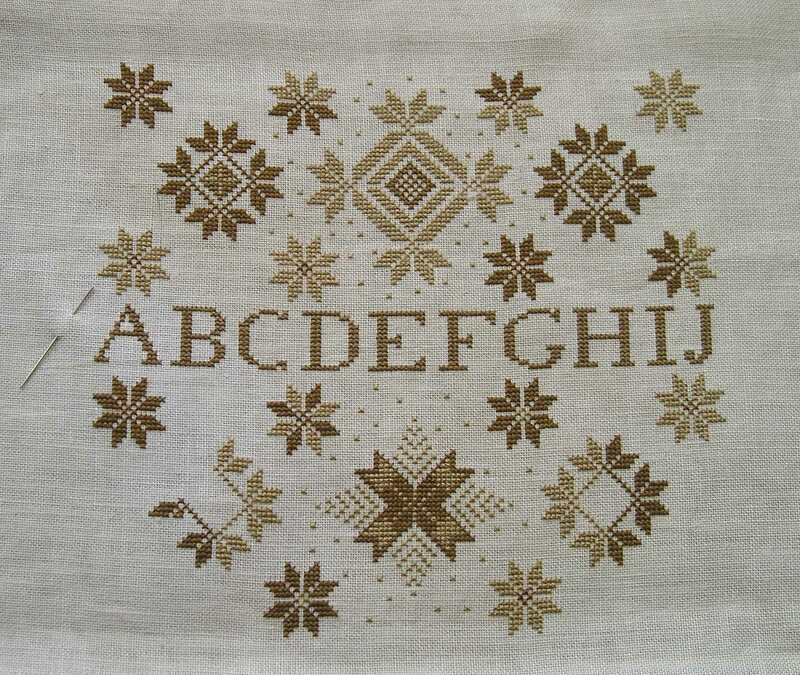 The stark, geometric look of this sampler is so beautiful to me, and you know I’m a sucker for anything with the alphabet on it. It also reminds me a little bit of the brown and gold calico quilts my grandmother used to make. In fact, the first quilt she ever helped me make was a wall-hanging with a large eight-pointed star on it not unlike the small repeated star motif just above and below the alphabet on this sampler. I hadn’t thought of that connection until just now. Funny. This is the third or fourth time I’ve worked with Splendor silks by Rainbow Gallery (colors: S1038, S1039, and S1040). I’m using the lightest brown and darkest brown for the geometric motifs and the medium (S1039) for the lettering of the alphabet. So far I give them a positive review. The strands divide easily, but not too easily, and even though silk can be notoriously fragile, these strands hold up very well in spite of the fact that I like to use relatively long lengths of floss while stitching. To me, time spent rethreading the needle is time lost. Next Post Michael Nesmith Hat Finished!